This post covers what happened in Decred in the month of December. 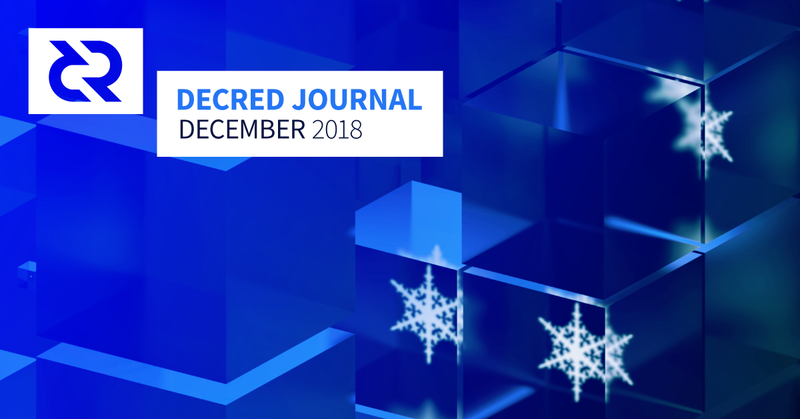 It is the 9th issue of the Decred Journal and you can find the original post on GitHub. Past issues are available via this GitHub link. The dcrandroid wallet for Android OS also saw its first release candidates available on the Google Play store. This benefits from Decred’s SPV mode which allows it to protect user privacy by requesting blocks directly from the P2P network instead of a centralized service provider — rare for mobile wallets. In addition to the caution about release candidates, please be aware that the mobile environment presents additional security concerns and is not advisable for large sums of DCR. dcrd: v1.4.0 RC2 was released. This version includes the smart fee estimator that allows the user to either minimize mining delay or the fee, depending on needs. The feature is important for Lightning Network and as a general mechanism to handle network congestion. Whitelisted inbound peers are now allowed regardless of connection limit so that operators can always allow their own SPV clients. Several performance improvements to initial sync, validation and network operations are included. Users choosing to upgrade should note there is a one-time database migration which will take 30–60 minutes depending on hardware. See full list of changes in the release notes. In December the Treasury received 17,016 DCR and spent 12,570 DCR. Using December’s daily average DCR/USD rate of $17.5, this is $298K received and $220K spent. As these payments were for work completed in November, it is also informative to consider them in the context of the November average daily rate of $32.5 — in which case the USD received/spent figures are $553K/$409K. Rejected proposals: Radio ads (69% No), Decredex (96% No), Bcash’s ATM integration (89% No); participation varied between 24–31% of tickets. Staking: 30-day average ticket price was 103 DCR (+0) per dcrstats.com. The price varied between 101 DCR and 107 DCR. Locked amount was 4.14–4.23 million DCR, which corresponded to 46.3–47.1% of the available supply. Binance Blockchain Week in Singapore on Jan 21–22. @guang will attend and represent Decred. TabConf in Atlanta, USA on Feb 8–10. @moo31337 will present “Decred 101: An introduction to Decred” on Feb 9. The North American Bitcoin Conference in Miami, USA on Jan 16–18. @jy-p will present Politeia and explore a wide variety of applications that could utilize it. Please message @Dustorf if you’re interested to help out at the show. Campus Party in Sao Paulo, Brazil on Feb 12–17. Decred will have speakers and a dedicated area for hackathons. Jalisco Talent Land in Guadalajara, Mexico on Apr 22–26. Decred will have a booth. @elian will present an overview of Decred with Q&A, plus there will be walkthroughs how to use software and vote. Contact @elian if you’re interested in helping/attending. Decred Journal — November 2018 in Spanish by @elian, in Polish by @kozel and in Russian by @DZ, in Chinese by @guang. November issue was the biggest so far (59 KiB), thank you all for the epic translation effort! Prototype community issue tracker was started to discuss actionable ideas in a more structured format. Any idea that benefits the project can be discussed. As of Jan 10 there are 73 issues like article ideas, PR, archiving and data preservation, or discussion of communication platforms. For example, this issue captures a challenging task to find a good name for Decred’s hybrid PoW/PoS consensus algorithm and lists all options suggested so far. You can subscribe to everything with the Watch button on top, or to individual issues with Subscribe button on the right panel. There is a popular belief that “GitHub is for developers” — this is not the case. Posting issues and comments and ‘+1’ is no harder than using Reddit or chat and in fact multiple non-developers already contribute doing just that. In December DCR was trading between USD 14.2–21.4 / BTC 0.0042–0.0058. The average daily rate was $17.5. A short price rise to USD 20.9 / BTC 0.0058 happened on volume increased to USD 5–6 million compared to USD 0.8–1.2 million on other days. Note that the trading volume data is not reliable, as noted below. The first round of voting on Aragon Governance Proposals (AGPs) has been delayed due to potential network instability around the Ethereum Constantinople hard fork — hopefully “blockchain down for maintenance” is not a problem Decred will encounter with Politeia. The CEO of Aragon Association published a blacklist and wishlist for proposals before proposal submissions opened. In the first proposal the AGP process itself was approved by 99.97% of the ANT that voted. In total 2.6% of all ANT tokens voted on the first proposal, from 45 unique addresses, with ~60% of ANT votes coming from one address. AGPs go through a review by the board of the Aragon Association, then a community review, before a 48 hour voting period opens.